Editor’s note: As a part of the development of this article, the Crystal Ball team compiled a database of county winners going back to 1836. Click here to access it. Political types may love the 2016 election, but we recognize that for many, it is a dreary affair. Media saturation and two unpopular candidates can make following it a daily slog. Unquestionably, though, this campaign presents the opportunity to observe some fascinating changes in the American electorate. Donald Trump’s chances seems predicated on popularity with non-college educated whites, which he hopes will push him over the top in a few blue states. Meanwhile, Hillary Clinton is banking on demographic changes and the erosion of Republican support among more educated conservative voters to compensate for any loss among the working class. This dynamic could manifest itself in breaking some durable streaks of voting for a party on the county level. In the past 100 years there have been nine elections where the winning party won the popular vote by at least 15 percentage points: six such victories for the Republicans (1920, 1924, 1928, 1956, 1972 and 1984) and three for the Democrats (1932, 1936, and 1964). That means the number of counties that have consistently voted one way either for or against a party — which is not always the same because there have been third party candidates that won at the county level as late as 1992 — is very small. And if the 2016 election proves to be a realigning one, then we could see some long partisan streaks at the polls snapped. Ogle and Lee Counties, Illinois: Haven’t voted Democratic ever (since 1836) and since 1852, respectively. Ogle and Lee Counties predate the Republican Party, but once the GOP was established in 1856 both counties have voted for a Republican in every election (if you count Teddy Roosevelt in 1912 as a Republican). Situated in Northern Illinois but outside the Chicago collar counties, in 2008 they were the only red dots in that part of the state to vote against their then-senator, Barack Obama. However, John McCain’s margin there was pretty narrow, winning with 52.7% in Ogle and 50.5% in Lee. They both voted more Republican in 2012, but Mitt Romney only won with 57.4% in Ogle and 52.5% in Lee. It stands to reason that if DuPage County native Clinton can win a major national victory that she might carry Lee and Ogle with her, especially because neither gave more than 37% to Trump in the Republican primary. These counties do not have a particularly large base of college-educated voters, but Obama trailed here by small enough margins that a solid Clinton win could turn both blue. In some states, counties featuring college towns can function as blue dots in otherwise red maps, like Boone County, Missouri, Clarke County, Georgia, and Monroe County, Indiana. But the home to Kansas State University has gone in the other direction, voting Republican even as FDR carried most of the rest of Kansas in his 1932 and 1936 statewide wins (the state has voted uniformly Republican ever since, with the only exception being LBJ’s landslide in 1964). But if Trump proves as unpopular among college-educated whites as recent polls suggest, that spells bad news in Riley County, as 45% of the population has at least a bachelor’s degree. Further, the Republican brand in Kansas has taken a hit of late because of unpopular Gov. Sam Brownback; even as he won reelection, Brownback lost Riley by eight points. And if Clinton can harness college students’ enthusiasm for Bernie Sanders, or contempt for Trump, then Riley County, which only voted 54.5% for Mitt Romney, could vote for a Democrat for president for the first time ever. Even under the best of circumstances it’ll be hard for Clinton to win a two-candidate race in this dark red Indianapolis suburb that used to send Dan Burton to Congress. In 2008, when Indiana was contested, McCain got 60.6%, and four years later Mitt Romney won 66.2% in a blowout. Swinging 17 points in four years is unlikely. But about 56% of Hamilton County residents age 25 or older have at least a bachelor’s degree, one of the highest rates in the nation. Further, the addition of Mike Pence to the ticket may end up being a mixed blessing here — his social conservatism might be a millstone in the Indianapolis collar counties even as it plays well outstate. Moreover, if Gary Johnson can peel away enough upscale voters, he could help flip the county to Clinton. This is another highly educated, suburban collar county where Trump could be in trouble. Central Ohio was one of the areas where Democrats actually held their ground between 2008 and 2012, showing that Greater Columbus is generally trending blue. While Mitt Romney still got 60.9% here, more than half of adults have a bachelor’s degree and it was Trump’s worst county in Ohio during the primary, only giving him 21.7% (though, in fairness, Central Ohio is John Kasich’s base of support). Johnson County, Kansas: Hasn’t voted Democratic since 1916 — or 1932? Sources differ on the outcome of the 1932 election. Johnson County has either not voted for a Democratic presidential nominee since 1916 or 1932 — different sources peg Herbert Hoover as the victor by just two votes or Franklin Roosevelt as the winner by 14 votes in the latter election. Regardless, it’s been a long time since the county backed a Democrat. Today, more than half of Johnson County residents over 25 have at least a bachelor’s degree, making it unlikely Trump matches the 57.6% that Romney got here. The state Republican Party isn’t as unpopular here as in Riley County (Sam Brownback still won here, but narrowly), but the same dynamics at work in Hamilton County could be in play here. And some surveys have suggested a Clinton win in Johnson is possible: A GOP poll of Kansas’ Third Congressional District and a statewide survey both showed Trump trailing Clinton in that part of the state earlier in the campaign. As a result of long-term demographic trends as well as Trump’s alienation of many white college-educated voters, this may be the most likely county with a long GOP history to flip to the Democrats. Whites with a college degree make up about one-fifth of the adult population while adult Latinos form nearly 30% and adult Asian Americans are almost 20%. The latter group may be prone to defection in this election: Many are Vietnamese refugees and their descendants, and they have traditionally voted Republican more than other Asian-American voters. The home of John Wayne and John Birch narrowly voted Republican in the past two cycles (50.2% in 2008, 51.9% in 2012). Voting registration figures are a bit of a lagging indicator, but they provide further evidence of a downward trend for Republicans. Boise fills in the blank in “____ is the new Austin.” The city has great high speed internet! It’s educated (36% of Ada County has a college degree and the number in Boise proper is probably higher). And it’s less Republican than the surrounding state, with the GOP failing to crack 54% in the last two presidential elections. Further, Boise is home to a sizable Mormon community and Trump has shown difficulty in winning that usually-Republican voting bloc over, as was shown when he only got 30.4% of the vote here in the Republican primary. If Democrats want to win Arizona for just the second time since 1948, it’s hard to see how they do it without Maricopa. While it’s given Republicans 54% in the past two elections, Trump runs into the same issues here that he does in Orange County: Latino antipathy (the group forms about one-quarter of the adult population) and a sizable number of college-educated whites (nearly 25% of the 25 years or older population). Further, the Mesa area is home to a sizable LDS population, and Arizona could be one of Gary Johnson’s best states. Obama lost the county by almost 150,000 votes, but given the close polls in Arizona Clinton could very well improve on that. Maricopa dominates Arizona’s voting — it cast about 60% of Arizona’s votes in 2012. So if Clinton is more competitive statewide than Democratic presidential nominees typically are, that means the margin in Maricopa will be tighter, too. The 2008 result in Sarasota County was tantalizingly close — McCain won by just 211 votes out of more than 200,000 cast. Romney bumped the Republican margin back up to 15,000 votes in 2012, but with a 31% college-educated population and a growing Latino population, Trump faces potential headwinds here. Of course, Democrats won’t be immune to broken streaks in 2016. Democrats continue to face an eroding base among the white-working class that was once their rock — and Trump looks set to win these voters by an even bigger margin than Republicans typically do. In theory, that means there are plenty of ancestrally Democratic counties that could turn against the party. The problem with that analysis is that, for the most part, Democrats have already lost those counties. In perhaps the most extreme example, Knott County, Kentucky gave Al Gore 67.3% of the vote and Mitt Romney 72.5% of the vote just 12 years apart. Additionally, the sheer size of some of the big GOP landslides of the past several decades means that there are just fewer counties with very long Democratic winning streaks that could flip in this election. And Democrats generally win fewer counties anyway — Barack Obama, even in victory in 2012, only carried about one-fifth of all the nation’s counties. Still, there are a few areas that could see a Republican win for the first time in decades. 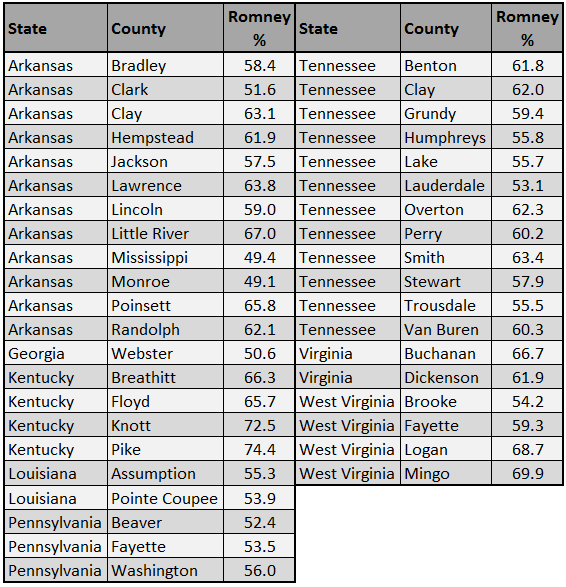 Elliott County wouldn’t be on this list if Romney had won 61 more votes in 2012. The Huffington Post went here in 2013 and found local Democrats optimistic that Clinton could reverse the trend toward Republicans, but her comments on coal could help snap the longest Democratic winning streak in the country. For the record, if Democrats lose here in 2016, then Starr County, Texas will have the longest Democratic voting streak (since 1892). Starr is 96% Latino, so it’s not at risk to break its own streak in the coming decades. It’s weird for a county where Obama won with nearly two-thirds of the vote to make this list, but Trump may need a weird election to win. Deer Lodge is 91% non-Hispanic white and 19% college educated, so if he wins it’ll be because places like Deer Lodge broke heavily in his favor. This dynamic could be replicated in neighboring (and bigger) Silver Bow County, which hasn’t voted for a Republican nominee since Dwight Eisenhower. Trump is hoping for a similar dynamic in places like Mahoning and Trumbull counties in Ohio (Youngstown and its neighbors), places where Obama got 60%+ in 2012 but where both demographics and anecdotal evidence suggest that Trump should be able to improve on Romney’s performance, perhaps by a lot. However, while these counties have voted much more Democratic than the nation ever since the Great Depression, they have on occasion voted Republican in big wave years (both did so in 1956 and 1972). So they are not included as streak breakers even though Trump winning them would represent a monumental reversal from 2012. Obama only got 50.3% in this ancestrally Democratic county with a 17% college-educated population, around the national county median of 18%. Sounds ideal for a Trump takeover, but the Portland suburbs are spilling over here and could stanch any blue-collar trend toward Republicans. Neighboring Clatsop County hasn’t voted Republican since 1956 and, while more Democratic, could see a similar trend in a good Trump year. With a college education rate of just 15%, an 81% non-Hispanic white population, and an industrial job base, this county that’s perhaps best known for producing Nirvana should be ripe to turn Republican. However, it went from 56.0% Democratic in 2008 to…55.1% Democratic in 2012. If there’s a significant Republican trend here, it’ll be new. Its neighbor, Pacific County, hasn’t voted Republican since 1952 and the two counties are probably a package deal. Itasca and three other northern Minnesota counties last voted Republican when Herbert Hoover was on the ballot. The others gave at least 59% of the vote to Obama, making Itasca, which only gave Obama 53.7% in 2012, the most likely to switch assuming a substantial white working class shift. Trump isn’t really targeting the state but Republicans seem bullish on their chances of flipping Minnesota’s Eighth Congressional District, a rural district that contains Itasca. This tiny western Minnesota county has a 17% college education rate and gave 54% of the vote to President Obama in 2012. Like Itasca the trend in 2012 wasn’t strongly against Obama, but it’s small enough that minor disruptions to the electorate could be felt more grandly here. Counties with winning streaks — will they be broken? Home of Terre Haute, Indiana’s Vigo County famously (again, within political science circles) has the longest winning streak of any county in backing presidential election winners – it has sided with the winner in every election since 1956. However, in 2012, it only gave President Obama a 343-vote plurality (out of nearly 40,000 votes cast). With an 86% non-Hispanic white population, 22% of over-25s holding at least a bachelor’s degree, and Mike Pence on the ticket (he lost the county in his 2012 gubernatorial election but his opponent was from the area), it might vote for Trump even if he ends up losing the election. If Clinton loses Buncombe County, it’s hard to imagine her winning the election – Buncombe County (home of liberal Asheville) is the type of upwardly mobile, educated (35% with at least a bachelor’s degree) county that Democrats are banking on being part of their enduring base. The liberal trend is obvious when one sees that the county actually swung toward Democrats from 2000-2004 (John Kerry only lost it by 623 votes out of more than 100,000 cast) and the rather minimal one-point drop in Obama’s performance from 2008-2012. And these gains came on the backs of white liberal voters. The county is 84% non-Hispanic white, and it gave Bernie Sanders 62.2%, his second-best county in the state of North Carolina (he lost the state 54.5%-40.9%). So if Clinton loses here, it’s probably due to weakness on her left flank. Luckily for her, Green Party nominee Jill Stein isn’t on the ballot in North Carolina. Westmoreland County is 30% African American, which will be key for Clinton to beat Trump here because only 16% of the county has at least a bachelor’s degree. Black voter turnout reached historic levels in 2008-2012, and Democrats may be hard-pressed to replicate that going forward, although Trump has somehow managed to underperform Mitt Romney among African-Americans in some polls. If Westmoreland County turns red, it may mean that her coalition is cracking, though Tim Kaine, who won more than 52% of the vote here in both of his statewide campaigns, could help keep Westmoreland blue. Trump’s strategy basically accepts that he has no chance of improving Romney’s margins among minority voters and thus needs to increase his margins among whites. And the blue states where he can best cut into margins among white voters are in the Upper Midwest (Iowa, Minnesota, and Wisconsin). The problem is that he didn’t win any of these states during the primary. Minnesota was one of only two “states” to vote for Marco Rubio (along with Washington, DC, Rubio cobbled the Mondale coalition back together), and Wisconsin gave Ted Cruz’s campaign new life when it rejected Trump in April. So if Trump can carry these rural Wisconsin counties, then his plan could work. Trump did win majorities in both counties even as he lost Wisconsin to Cruz during the primaries. Ottawa County is overwhelmingly (93%) non-Hispanic white and not exceedingly well-educated (21% with a bachelor’s degree or higher), making it a prime candidate to flip to Trump. The Republican nominee narrowly lost the county 42.9%-38.7% to Kasich, but that was below Kasich’s margin in the state and a better performance than the businessman had in the Cleveland or Columbus suburbs. Fortunately for Clinton, losing Ottawa County would only mean the loss of about 1,000 net votes. For comparison’s sake, 600,000 Romney voters combined live in well-educated Cuyahoga (Cleveland), Franklin (Columbus) and Hamilton (Cincinnati) Counties. Like Vigo County, this is a bellwether that Clinton can do without. Including Valencia County on here is a bit of a cheat: It has voted for the winning candidate for as long as Vigo County, but before 1981 neighboring Cibola County was part of it. Al Gore would’ve won the combined old county in 2000 and there’s no easy way of knowing if new Valencia County would’ve voted for Carter in 1976 or Kennedy in 1960 (Cibola is more Democratic than Valencia). But I’m including it here to note that in 2012 it only gave a 686-vote margin to President Obama, and while it is 59% Latino, only 16% of people have at least a bachelor’s degree. From 2008 to 2012, Democratic performance worsened by four percentage points, so Clinton will need Latino voters mobilized to prevent Valencia from flipping. Finally, a quick word on losing streaks: in American politics they don’t last that long. For example, after the 2000 election there were only two counties that voted for losing candidates in two consecutive elections: Orange County, Florida and Charles County, Maryland. Whatever trends make counties go against the national consensus typically don’t last for long. As of today, there are 40 counties stretching from Louisiana to Pennsylvania that haven’t voted for a winner since the 1996 Clinton-Gore ticket. Among the counties in the Losing Streak 40, 24 are in Arkansas and Tennessee, showing that perhaps some residual affinity for their home state president (Clinton) and vice president (Gore) kept them blue before Obama pushed them toward the Republicans. Most of the Losing Streak 40 counties in the Deep South are small and rural, with only one in the former Confederacy having more than 30,000 residents. And some don’t seem like they’ll vote Democratic again in a generation — Mitt Romney won at least 65% in nine of them. A win by Trump would most likely snap the streaks of all of the Losing Streak 40, but there are some that Clinton could flip without a nationwide blowout, as shown in Table 1. Mitt Romney took 56% of the vote here, but this county is transitioning along with Pittsburgh (in neighboring Allegheny County) from blue collar to white collar. More than one-fourth of residents have at least a bachelor’s degree, the highest rate of any county with a four-cycle losing streak. The Republican candidate has increased his share of the electorate in every election here since 1992; maybe Trump will stop that trend. Neighboring Beaver and Fayette Counties don’t have as many educated voters but their percentages voting for Romney (52.4% and 53.5%) are low enough that a Democratic wave would wash over them more easily. This tiny Deep South county is small enough that its results can be chalked up to statistical noise. President Obama improved his margin in Webster from 2008 to 2012, as he did in much of the Deep South. Assuming African-American voters can stay mobilized, this county could break for Clinton while the rest of the losing streak counties vote for Trump. These 12 counties gave between 49% and 67% to Mitt Romney, so there’s a range of margins that Clinton would need to eat into. Some closer to the Mississippi River saw improvements in Democratic performance from 2008-2012. There’s hardly any polling here, though some recent 50-state surveys by Washington Post/SurveyMonkey, Reuters-Ipsos, and Morning Consult all showed Clinton, the former Arkansas first lady, improving on Obama’s 24-point losing margin from 2012 to varying degrees. The Electoral College indicates a relatively stable electorate. None of the states that have voted Republican in every election since 1980 seem likely to flip (though some polls have showed South Carolina close and there does seem to be something weird going on in Kansas). And Trump seems unlikely to win any state won by Democrats in every election since 1992, even if he does seem to be devoting some resources to Pennsylvania. But if you drill down to the county level you can see important changes afoot. Republicans are losing ground in the upwardly mobile and diverse areas of the country that are driving population growth. But Democrats are losing ground among the more elderly and less transient populations that vote more reliably. In the long term this is great news for Democrats because, in spite of Winston Churchill’s aphorisms, ideology tends to stay consistent as people age. However, in the short term this dichotomy has created a dynamic in which Democrats win high-turnout elections but lose low-turnout ones. But this is not a permanent state. If Democrats manage to break some Republican streaks in 2016 it might be evidence that they can count on support from more reliable voting blocs. Places like Walworth, Johnson, and Delaware counties have reliable turnout even in off-years. And if Democrats manage to maintain an edge or even keep Republican margins down in such areas that might force the Republican Party to change its platform to appeal to an evolving electorate. Robert Wheel (a pseudonym) is an attorney and University of Virginia graduate who lives in New York. He tweets @BobbyBigWheel.